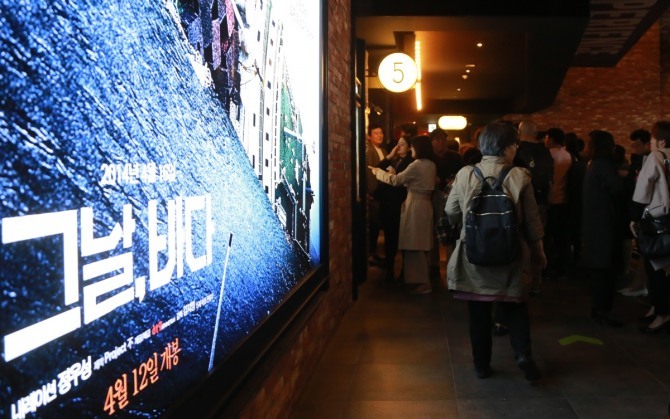 A documentary film on the Sewol ferry tragedy of 2014 opened in local theaters Thursday, with the creators tracking down what they say is the real reason behind one of the worst maritime disasters in Korea’s history. “Intention” was directed by Kim Ji-yeong and produced by journalist Kim Eo-jun. It analyzes the data of the ship’s automatic identification system, and comes up with what they claim is the real reason the cruise ferry sank on April 16, 2014. The Sewol ferry sank off the coast of Jindo, South Jeolla Province, leaving 304 dead or missing. Irregularities surrounding the sinking -- including a corrupt network of connections and ineffective chain of command in rescue operations -- and the fact that most of the victims were high school students sparked nationwide furor. A government investigation found excessive cargo caused the ship to capsize upon a sharp turn, but conspiracy theories have abounded. “Intention” starts off from the fact that part of the AIS record of Sewol remains missing and, based on other records of the Sewol, comes to the conclusion that government data have been rigged. The movie simulates the Sewol’s path on the fateful day, and claims there was an irregular amount of pressure added to its port side. It claims the left anchor was lowered as the ship sailed, and was caught on the ocean floor. “Intention” was filmed on a budget of 2.3 billion won ($1.9 million) raised through crowdfunding. Actor Jung Woo-sung provided the narration for the feature pro bono. “I participated in hopes that more people would remember the Sewol tragedy, marking its fourth anniversary,” he wrote on his Instagram page. Monday marks four years since the sinking.